Both conventional oil and gas have peaked in Canada. The nation is running out of natural gas. Yet Canada cannot stretch out dwindling stocks for Canadian needs by cutting exports. Instead, more than half of its gas has to be made available to the U.S. Canada could also be prevented from providing its own oil to its own citizens in an international oil shortage. The reason: the proportionality clause in NAFTA. Proportionality is an obscure sounding clause which requires Canada to maintain its current share of energy exports to the United States, even if Canadians experience shortages. It effectively guarantees the U.S. access to Canada's energy resources in perpetuity, or until NAFTA and the FTA are renegotiated or ended, or the resources run out. This clause is unique in all of the world’s treaties. Even Canada’s fellow NAFTA partner and major oil exporter, Mexico, is exempt. substituting Canadian oil for volatile foreign imports. The report describes how NAFTA limits Canada’s options for managing its energy future and recommends options for regaining Canadian energy security and sovereignty. The proportionality clause has been abruptly reawakened in a number of public debates. First, in the U.S. Democratic Party leadership race, Barrack Obama and Hillary Clinton called for renegotiating or ripping up NAFTA. Second, natural gas has peaked and is running out across Canada and in Alberta. In Alberta this has meant that the government is failing to enforce the 15-year rule meant to protect Alberta's supply. Third, debates surrounding liquid natural gas imports into Qu'bec have focussed on the trade implications. Finally, tar sands and pipeline expansions are increasing exports, and thus increasing commitments under proportionality. Canada has only 9.3 years left of 'proven' supplies of natural gas. Yet Canada exports about 60% of its gas to the United States, a share that is locked in by NAFTA's proportionality clause. After natural gas was deregulated in 1986, production doubled by 1999, but exports quadrupled. Production of natural gas peaked in Canada in 2002. During 13 out of the first 18 years after the FTA went into effect we have drawn down rather than increased reserves of natural gas. There are only 8.07 years of established remaining reserves for Alberta. Of course, potential reserves are higher than the level of established reserves. The Department of Energy estimates a further 51 tcf are 'yet to be established.' But, given Alberta's cold winters and the need to be cautious in planning for Albertans' long-term future, it is best to count on established reserves only. Even Coalbed Methane can at best slow Alberta's declining gas production. The EUB Report forecasts a decline in total gas production in Alberta by 2016, even with CBM. Ironically Alberta does still have a supply safeguard, requiring a minimum of 15 years of proven supply before natural gas can be exported from the province. However, with just over eight years of proven reserves and falling, the government is failing to enforce its own law. No one has called the government to account for this. This report does so. Compounding that short-sightedness is the burning of natural gas to extract oil from the tar sands, over 60% of which is exported to the U.S. This problem will increase exponentially as the tar sands expand from the current 1.2 million bpd to more than double that by 2016. Recent energy debates in Québec have centred on Québec's vulnerability due to 90% of its oil coming from foreign imports. However, Québec's proportionality debate broadened to include two planned, liquefied natural gas [LNG] terminals near Québec City. Concerns are that NAFTA's proportionality clause would reduce energy security for Québec and Canada. Currently, Québec gets all its gas from Western Canada. The LNG terminals would bring gas from Russia or other countries for use in Québec and for export to the U.S. Proponents are that this would increase the diversity of Québec's sources of natural gas. However, if Québec reduces its current purchases of natural gas from Western Canada because it is using imports, the Canadian gas Québec had formerly bought from the West will likely be sold in the United States. The resulting boost in Canada's natural gas exports would raise the proportion of total Canadian gas supply that is exported. This higher proportion would then be locked in by NAFTA as the share of total supply to which the United States would be entitled would rise. To illustrate the probable effect of the proportionality clause, this report runs through three scenarios under which the clause might be invoked. This exercise shows how, under certain circumstances, proportionality could actually lead to energy shortages for Canadians. The need for a hydrocarbons conservation program is urgent and imperative given all the ecological and social costs of unrestricted, rapid development, particularly of the tar sands. Canada lags behind other countries in developing solar, wind, geothermal and other renewable alternatives. This calls into question the wisdom of exporting so much of our non-renewable hydrocarbon resources. How would the proportionality clause affect a plan to achieve even a 10% reduction in oil production? The application of the proportionality clause would require Canada to continue exporting 47.5% of total supply to the United States. If Canada were to attempt a 10% cut in oil production while keeping domestic demand and imports at their average level over the years 2004 to 2006, there would be an eight million barrel annual shortfall in supplies available to meet domestic needs. This is equivalent to about four days of domestic demand. As fossil fuels continue to run out, our goal should be to use remaining reserves for a socially and ecologically responsible transition to a post-petroleum economy with hydrocarbons prioritized for value-added applications such as lubricants, paints, fertilizers, nylon, medical equipment and plastics. Conserving natural gas feedstocks would be also save jobs in an important Canadian industry (it employs about 24,000 workers) that upgrades natural gas into higher, value-added products. To this end this second scenario involves a decision to conserve natural gas as a feedstock for the petrochemical industry. As mentioned earlier, the Canadian natural gas supply situation is critical. What would happen if 10% of natural gas production was set aside in order to ensure sufficient supplies for petrochemical feedstock at prices below the world price for liquefied natural gas (LNG)? The proportion of total gas supply exported over the last three years for which data is available (2004 - 2006) is 51.5%. Maintaining that ratio would result in a shortfall of 627 billion cubic feet for domestic needs or 66 days of average domestic demand. Canadians need to debate the wisdom of relying on imports for half of our national consumption. Currently, Qu'bec and Atlantic Canada rely on oil imports for 90% of their needs. OPEC countries now supply the largest portion of those imports. Canadians need not rely on those imports. With a daily capacity of 240,000 barrels a day, Enbridge Line 9 can be reversed to ship oil east. The pipeline was reversed in 1999. It now brings foreign oil from Montréal westward to Sarnia. However, proportionality could restrict the Canadian government's ability to order this reversal. It is worthy of note that if Enbridge chose to reverse the pipeline for commercial reasons it would not run afoul of NAFTA's proportionality clause. Reversing the Sarnia to Montréal pipeline at its 240,000 barrels a day capacity (87.6 million barrels a year) to ship western crude to Montréal. This would bring the proportionality clause into play, but not result in a shortfall in overall supply available for Canadian needs. This would be the case even if the U.S. chose to import all 609 million barrels from Canada that would have to be made available to it under proportionality rules. Reversing the Sarnia to Montréal pipeline and redirecting Newfoundland's exports of 60.6 million barrels (in 2006) to domestic markets. Both measures would reduce imports by 148.2 million barrels. Since the U.S. would still be eligible to import 47.5% of Canada's total supply, it would be entitled to import 580 million barrels a year. 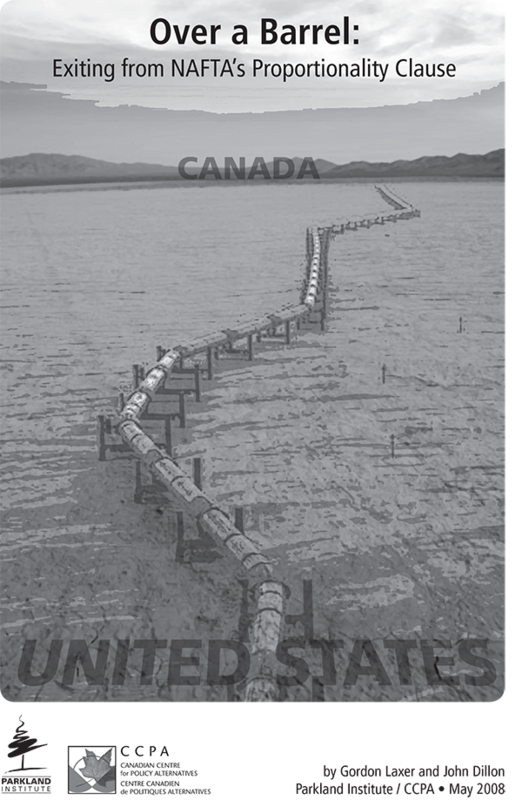 If the U.S. took the full amount, Canada's shortfall would be 31 million barrels, or 17 days of domestic needs. Doubling the Montréal to Sarnia pipeline capacity to 175.2 million barrels a year. Canada's import dependence would fall from 49% of domestic demand to just 23% though this would take several years to implement. The U.S. would be entitled to import 46 million barrels more per year than would be available to meet Canada's domestic demand. Canada's shortfall would be 25 days of domestic demand. These scenarios look only at proportionality but it is worthy of note that NAFTA's Chapter 11 on investment also impinges on Canadian energy sovereignty. For example, it could prohibit provincial or federal governments from demanding that corporations upgrade natural gas or crude bitumen into petrochemicals or refined products in order to create jobs or capture the value added through local processing. The clause has been invoked a number of times already relating to energy policy in Canada. Ending NAFTA would not automatically mean release from proportionality. The Canadian implementing legislation for NAFTA, known as Bill C-115, contains specific clauses designed to ensure that proportionality survives NAFTA's demise. This would need to be addressed as well. Both conventional oil and gas have already peaked in Canada. Canada imports about 49% of its oil needs, with almost half its imports coming from very insecure sources ' OPEC countries. Unlike all other IEA member countries, Canada has no Strategic Petroleum Reserves. Meanwhile, Canada is obligated by NAFTA's proportionality clause to make two-thirds of its domestic oil production and 60% of its current natural gas production available for export to the U.S., even if Canadians experience shortages. Most Canadians assume that Canadian energy supplies will be there when they need them. It hasn't dawned on most Canadians that their governments have signed away their right to have first access to their own energy supplies. This report shows that NAFTA's proportionality clause stands in the way of Canada developing an effective energy security plan. Whatever the merits were of energy proportionality in 1988 and 1993, when the FTA and NAFTA were signed, energy proportionality is unduly restrictive for Canada now and it must go. As the debate about NAFTA intensifies, Canadians must insist loudly and clearly that ending proportionality must be a non-negotiable priority. Canada should demand a Mexican-style exemption on proportionality. The timing to get this turned favourable after Barrack Obama pledged in February to renegotiate NAFTA. If the Americans come to the table with their issues, the other parties can bring their own issues for renegotiation too. Getting out of proportionality mustbe Canada's number one goal in such talks. And we must be willing to, as Obama himself pledged, 'use the hammer of a potential opt-out [of NAFTA] as leverage to ensure we actually get ...' what we demand.